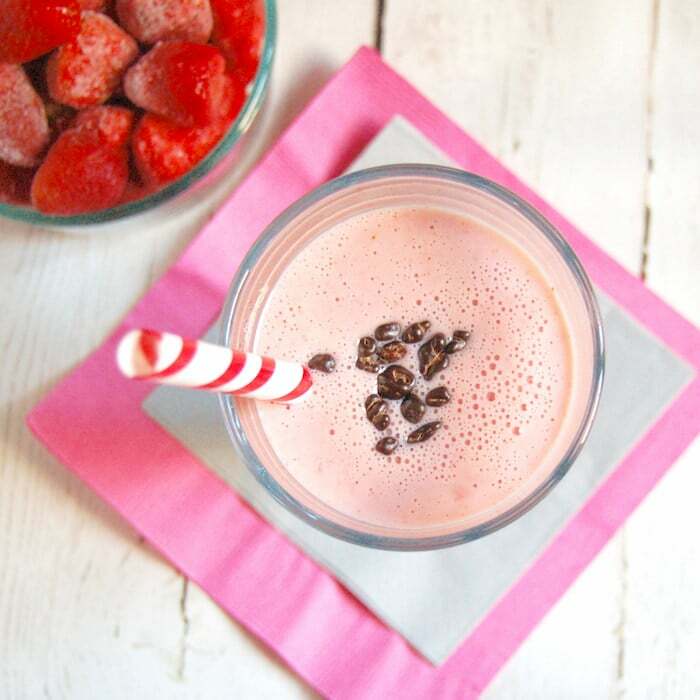 This bright and creamy Strawberry Kefir Smoothie is filled with good-for-your-gut probiotics and is a quick and easy breakfast or snack that will satisfy your tastebuds. I’m not going to lie – I’ve never been the biggest smoothie fan. They’re easy to make and depending on what’s in them, they are refreshing and yummy, but I’m more of an “eat your fruits and veggies” type of girl. I like to chew my food – it’s just more satisfying for me and keeps me satiated for longer. Plus, the thought of taking out the blender and doing more dishes isn’t so appealing, especially in the morning when I’m trying to get my girls fed, teeth brushed, coats and shoes on, and out the door for school. All that said, smoothies are popular for good reason. They are quick to whip up, they’re an easy way to get in a serving or two of fruits and vegetables (which many of us are not getting enough of), kids tend to love them (my girls certainly do), and they can be made ahead, which is perfect for those rushed mornings I just described. And you can’t tell me this Strawberry Kefir Smoothie isn’t pretty! Just look at that lovely pastel pink color – especially perfect for Valentine’s Day today! It’s also lots of fun to jazz up your smoothie with colorful straws and yummy toppings. 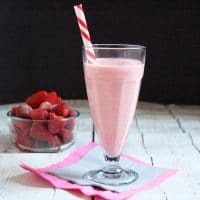 Most smoothies are made with some combination of milk and yogurt, but lately my girls have been enjoying kefir for breakfast, so I decided to use the probiotic-rich beverage as the base for this Strawberry Kefir Smoothie. As recently explained, a diet rich in prebiotics and probiotics can help maintain a healthy gut, which is important for overall health. Kefir is a drinkable liquid yogurt that’s been cultured longer than yogurt, and with as many as 12 strains of good bacteria it’s a good source of probiotics. It’s also a good source of protein and calcium and is well tolerated by people who suffer from lactose intolerance. Taste-wise, plain kefir (like plain yogurt) is pretty tart, which is why many people who drink it prefer a flavored variety. Like flavored yogurts, flavored kefir is higher in added sugars, but I personally believe the benefits of kefir and yogurt are so great that it’s ok to have those added sugars if it’s the only way you’ll drink it. Just be sure to account for them in your overall diet. Of course if you’d prefer to stick with plain kefir but need to sweeten it up a bit, you can puree it with your own fruit and/or sweeteners the way I do here. 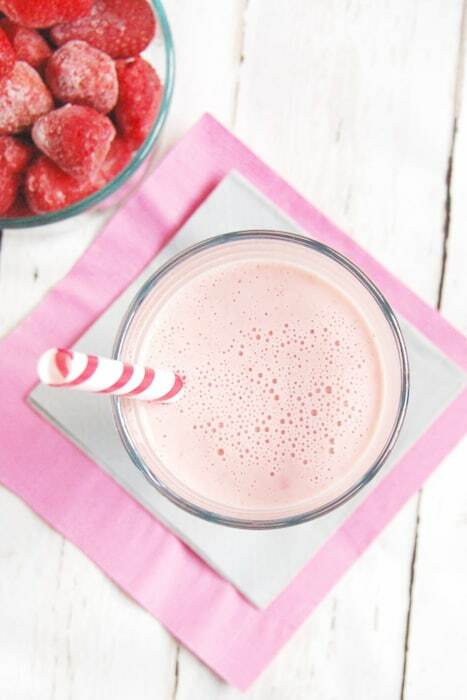 This Strawberry Kefir Smoothie blends together plain kefir for protein, probiotics, and calcium, strawberries and honey for sweetness, and lemon juice for a bright finish. In the spirit of Valentine’s Day, I topped the smoothie with cacao nibs, because who doesn’t love chocolate or the health benefits you get from it?! If you want a more chocolatey smoothie to celebrate the day, try this Dark Chocolate Strawberry Smoothie! One of the fun things about this recipe is that you can easily modify it based on your taste preferences or what’s in your fridge and freezer. You can also make it a more filling breakfast by turning it into a smoothie bowl and topping it with some more sliced strawberries, chopped nuts, and/or your favorite whole grain cereal. If you need a quick way to show your love to someone this Valentine’s Day, whip up this smoothie and serve it with a kiss and hug. You’ll make someone special very happy! This bright and creamy Strawberry Kefir Smoothie is filled with good-for-your-gut probiotics and is a quick and easy breakfast or snack that will satisfy your tastebuds. Gluten-free and vegetarian. Pour into a glass, top with cacoa nibs if desired, and enjoy! *If using fresh strawberries, add ice to the blender. What’s your favorite combo of ingredients? This recipe originally appeared in the February 2017 issue of Today’s Dietitian Magazine. I was compensated for writing the original article, “Probiotic-Rich Kefir,” and developing the recipe, but I was not compensated for sharing the column or magazine with readers on my blog. All opinions are my own. Thanks so much Laura! Pretty in pink perfect for little girls! I am definitely a smoothie fan and this one is so pretty. That color! My pink-loving daughter would go nuts for this too! Thanks so much Jenn! I have no doubt you guys will all love this! Can’t wait to hear what your daughter says! This is such a pretty smoothie! I share your feelings about smoothies, but I’ve been making them a little bit more recently! Thanks kaleigh! Now that I’ve been making them more I like them more too! And they really are so easy! I”m all about anything that is good for my digestion and this absolutely is!! Thanks Amanda! So glad you’re on board with this! I’ve always been a little afraid of Kefir but I finally tried it and it’s my NEW THING! Love this! I was too!! I’m actually so impressed by my girls that they will eat it plain! I’m so glad you’re into it now – perfect timing to make this smoothie! I LOVE kefir! I always wind up drinking it plain before remembering it’s good in smoothies too, lol. Haha that’s pretty awesome actually! Hope you’ll remember to give this smoothie a try ???? Cacao nibs not optional haha! 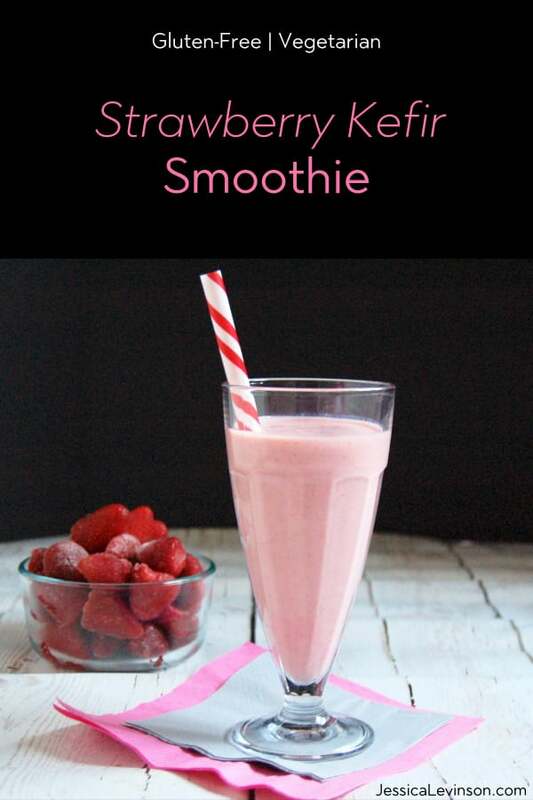 I love this – what a great way to combine healthy probiotics in smoothie form! Haha! They’re not optional for me either ???? Thanks so much Liz! This looks delicious! I have just been getting into incorporating more kefir and probiotics into my families diet, can’t wait to try this! Thanks so much Emily, and that’s great to hear! Can’t wait to hear what you think of the smoothie! What a delicious and healthy way to get my mornings started! Love how quick and easy it is to make! Just what I need on my busy mornings! Thanks Taylor. Hope you enjoy! What a great way to add probiotics. I love the beautiful strawberry color! Drink up! YUM! Love a good smoothie and such a great way to get in probiotics! I’ve been making a lot of probiotic smoothies lately. Thanks Sarah! So glad you’re into the probiotic smoothies – hope you’ll give it a try! Agreed, this is so pretty! I’ve actually got some dairy-free drinkable yogurt on hand (like kefir!) so I need to try this. This looks so simple and yummy!! That’s awesome Kara! I agree – it adds so much and all in one package. Can’t wait for you to try this recipe! I think this looks delicious–and it’s a perfectly colored pink, too. Perfect for days when we need a little spring! Thanks Abbey! I really enjoyed it as well! This sounds delicious! My son has recently become obsessed with smoothies – to the point where I think we’ve had one first thing in the morning every morning for the last three weeks. We’ll definitely give this one a try! Thanks Chrissy – let me know how he likes it! My girls also love smoothies and we go through jags like that too! Yay! Can’t wait to hear how you like it. Thanks Karman! Pinned! Looks so pretty, Jessica! This looks so delicious Jessica, the avocado, strawberries & kefir just makes a tummy feel good! Thanks Denise. There’s actually no avocado in here, but that sure would be a creamy and filling addition! So yummy- I’ve actually never bought kefir. Need to get on that! Thanks Lauren! I didn’t for a long time, but started getting it at Trader Joe’s and the girls really like it! Absolutely love using kefir in smoothies! Looks like a great recipe! Such a gorgeous shade of pale pink! We do a lot of smoothies here b/c my kids love them and so do I. I keep my blender out on the countertop at all times, and try and rinse it out right away, so clean-up isn’t an issue, but I hear ya’ about not wanting to do more dishes! My favorite smoothie as of late is frozen berries, unsweetened cocoa powder, soy milk + Greek Yogurt or Kefir. Yum!! Thanks EA! That’s smart to keep it on the counter, I just hate clutter on my counters! But now that I’m making the smoothies in advance it’s actually not so daunting to have to wash all the dishes and we enjoy them for breakfast. I have to add some cocoa powder to this one! Just a WARNING!!! I would NOT recommend lemon juice!!!!! I’m sorry it seems like you had a bad experience. Can you share what happened?